Long term debt will have a maturity of more than one year. This can be anywhere from two years, five years, ten years or even thirty years. The current portion of long term debt is the amount of principal and interest of this amount due within one year’s time. An analyst should attempt to find information to build out a company’s debt schedule.Debt ScheduleA debt schedule lays out all of the debt a business has in a schedule based on its maturity and interest rate. In financial modeling, interest expense flows into the income statement, closing debt balance flows onto the balance sheet, principal repayments flow through the cash flow statement, completing the scheudle This schedule outlines the major pieces of a debt a company is obliged under, and lays it out based on maturity, periodic payments, and outstanding balance. Using the debt schedule, an analyst can measure the current portion of long term debt a company owes. Borrower Inc. takes on a five year loan for $5,000,000. The loan terms specify equal principal payments over the five years. The current portion of this long term debt is $1,000,000 (excluding interest payments). A company reduces this line item by making payments towards the debt. As payments are made, the cash account decreases but the liability side decreases an equivalent amount. Alternatively, a company with good credit standing can “roll forward” current debt, by taking on more credit to pay this loan off. If the new credit taken on is long term, the current debt is effectively rolled into the future. From a cash flowValuationFree valuation guides to learn the most important concepts at your own pace. These articles will teach you business valuation best practices and how to value a company using comparable company analysis, discounted cash flow (DCF) modeling, and precedent transactions, as used in investment banking, equity research, perspective, there is no impact on whether debt is classified as a current liability or non-current liability. In financial modelingWhat is Financial ModelingFinancial modeling is performed in Excel to forecast a company's financial performance. Overview of what is financial modeling, how & why to build a model. A 3 statement model links income statement, balance sheet, and cash flow statement. More advanced types of financial models are built for valuation, plannnig, and, it may be necessary to produce a full set of financial statements, including a balance sheet where the current portion of long term debt is shown separately. This is simply to tie the numbers to what the accountant will produce. There is no impact on valuation by how the debt is categorized. To learn more, check out CFI’s financial modeling courses. 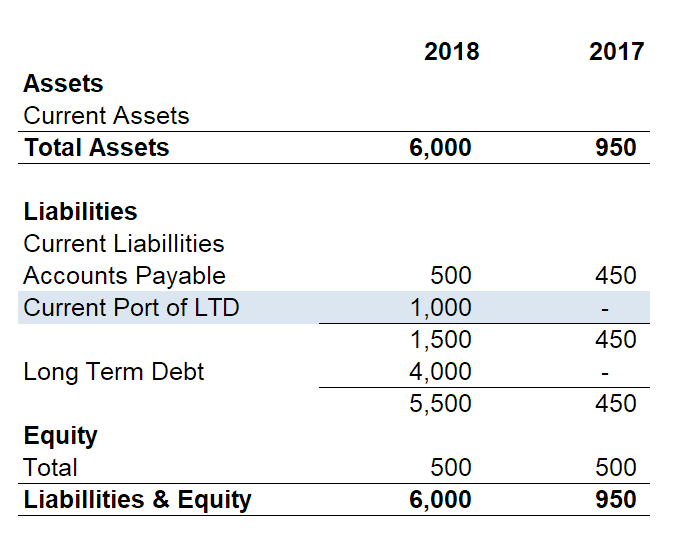 Thank you for reading this guide and examples of how to assess the current portion of long term debt on a company’s balance sheet. CFI’s mission is to help you advance your career. To keep learning and developing your knowledge we highly recommend these additional resources.